The boat is our home, all year round. Just like a house, a significant part of our energy use consists of heating. And again just like a house, the temperature of the outside air affects the inside temperature, as does the water temperature. We lose precious heat through the boat’s outer walls, the hull. To reduce heat loss, we insulated the entire boat with stone wool during our renovations. And it works. Compared to before we added the insulation, we use about half the energy to get and keep the boat warm inside. A Danish company aptly named Rockwool produces the material we used. They are headquartered just outside Copenhagen, and we have arranged to pay them a visit. After a half-hour train ride and ten-minute walk from central Copenhagen we are welcomed by Rockwool’s Sustainability Manager Connie Enghus-Theisen and Head of Public Affairs Susanne Kuehn. They explain that the company is world leader in the field of interior, exterior, roof and technical insulation. As the name suggests, Rockwool focuses entirely on stone wool, which is made of ordinary stone. “Those stones, they still have to be dug out, transported and processed. Doesn’t that take a lot of energy?” we ask Connie and Susanne. “True, but the energy used for is quickly compensated by the energy saved thanks to the insulation qualities of the end product.” Put differently, within 6 to 12 months the insulation saves as much energy as it cost to produce. After a year stone wool already makes a positive contribution. What about other types of insulation material, such as foam or glass wool? “Stones are widely available. Stone wool is completely recyclable, fire and moisture resistant. It is also safe to use and has superior insulation properties. That makes it very versatile.” Connie explains. Clearly, Rockwool is convinced they produce the best insulation product. We can test it ourselves in a separate part of the building, a kind of miniature science museum. We hold a stone wool plate made by Rockwool over a gas burner and turn on the heat. Nothing happens, it stays cold. It does not burn and no dangerous gases are released. This is perhaps even more important than the fire resistance, because most fire victims actually die from suffocation. We move to the next exhibit, where we get to pour water over stone wool. The water just drips off its surface. This water repellency is very important to us. We obviously do not want moisture to remain in the Rockwool, as it would affect the steel hull of the boat. Finally, we enter a sound room. Outside the room we hear the sound of children playing on a tape recording. Inside it’s quiet, the rock wool absorbs the sound. Another useful quality. Since the sixties, new buildings in Denmark have been getting increasingly energy efficient. That didn’t necessarily happen because residents or building contractors were environmentally conscious. It is the Danish legislator who tightened the requirements for new buildings every few years. For example, a building built in 2015 may consume a maximum of 30 kWh per square meter per year for its total energy use. This means that Denmark sets one of the strictest energy requirements in the world for construction. It fits within the government’s ambition to become independent of fossil fuels by 2050. As a result, many contractors use Rockwool products to achieve the necessary insulation levels. For existing buildings, the rules are less strict. Nevertheless, many homeowners know that good insulation is not only sensible for the environment but also for your wallet. 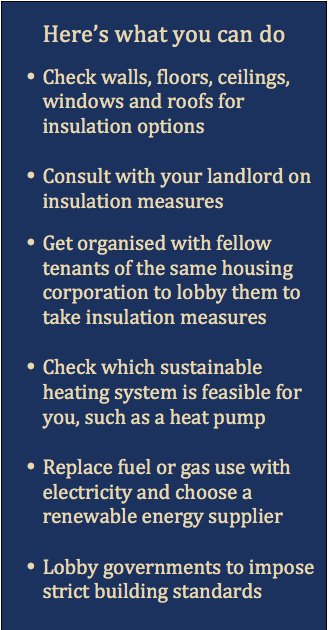 Indeed, insulating your home is probably one of the most rewarding ways to save energy and reduce your own CO2 footprint. The building where Connie and Susanne welcome us is itself an example of a successful transformation: from an old, poorly insulated office building to a state-of-the-art reception and exhibition space. Its walls and ceiling are well insulated and sensors automatically dim the light and regulate air circulation. Rockwool wants to show that energy efficiency can also be achieved in existing buildings, without resorting to energy and material-intensive new construction. The insulation lessons from our boat and Rockwool are also part of a larger story. Constructing a renewable energy infrastructure with solar panels, heat pumps and wind turbines is costly. In addition, it requires finite materials and non-renewable energy sources, such as metals, coatings, oil and gas. This short video makes that point quite clear. It is therefore not surprising that many experts argue that reduction of energy use is a core component of a successful transition towards a renewable energy infrastructure. You could even say that insulation is a kind of sustainable energy source in itself: The better the insulation, the lower the need for renewable energy. So if we can reduce our energy consumption through insulation, we not only achieve an immediate, direct gain that translates to monetary savings, but also a more long-term, indirect gain due to the reduced need for a new energy infrastructure. Back onboard we take stock of how well insulated the boat is. The stone wool took some work to get into place – we did it in stages during the full renovation of the boat – but it was worth the effort. It insulates well. In addition, the double-glazing keeps the cold out and the warmth inside. The renovation has certainly made a tangible difference in reducing our diesel fuel consumption, which is further reduced by our wood stove that reduces the use of our central heating system. So what opportunities do you have in your house to save energy? Reducing CO2 emissions now is really everyone’s responsibility. The example of insulation shows that small changes can make a big difference. Absent government regulation similar to the Danish building standards it is up to each individual to make the necessary choices themselves, be it in their lifestyles, consumption or, as we describe in this article, in their houses. Needless to say we encourage you to make those investments, which pay off in the long term, be it in monetary terms or in terms of benefit for future generations. At the same time, we see a responsibility for governments. The Danish example shows that strict building regulations can be a very effective tool to promote energy-efficient buildings. And finally, where governments do not impose such standards, housing corporations can do their bit to build sustainable, well-insulated houses. Again, this not only makes sense from an environmental point of view, but also economically. Well-insulated houses can also save their occupants a lot of money. The video of our visit to Rockwool.